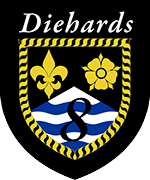 "Once a Diehard - always a Diehard"
If you have been invested as a Diehard Scout and for whatever reason are now unable to continue active service you are automatically a member of our Old Scout Branch. This is a unique but very important section of our Group, though not regarded as an official section by HQ it fulfils a number of purposes by keeping in touch with previous members. We wouldn't be where we are today if it wasn't for the Old Scout Branch, they masterminded the rebuilding of our magnificent Mansergh and kick started the Group after its dormant period. This section was the brilliant idea of the late Les Kirby who not only founded the Group in 1921 but also the Old Scout Branch in 1929. He saw a need to keep in touch with members who were unable to make a regular commitment and though its main function is the Annual Reunion several members are heavily involved in the Group today behind the scenes keeping the Group going and are core members of the Group Executive. LJK formed the OSB and drew up a constitution, he commissioned an O.S Chairmans badge which is ceremonially passed on at Reunions to the incoming Chair. The Group has a Diehards tie which members wear on occasions such as the Reunion or other Group functions. 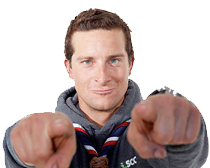 Such was the success of the Branch that Scout HQ based the BP Guild on Les' original model. The BP Guild is still going today! 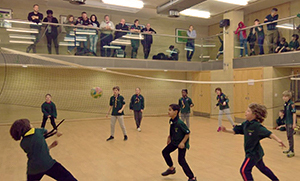 We can safely say that the 8th St Marylebone O.S.B comprise the oldest form of retired active scouts or Old Scouts in the country. If you want to be more active then there are plenty of opportunities with the sections or behind the scenes. Old Scouts assist with catering at camps, come along on a section evening with a specialist topic, facilitate the running of The Mansergh and maintenance of equipment and are involved with the archives of the Group. One of the main functions the OSB organise every year is the Reunion - we passed our 80th Reunion on 25th March 2015. It is a unique and fun evening which involves current members, parents and friends over a dinner. It is packed with good humoured 'spontaneous toasts', loyal toasts to the Queen, Chief Scout & the Scout Association and to our founder LJK. However to many, the most important formal toast is to Absent Friends - members who have Gone Home and are now remembered in The Sanctum at The Mansergh. 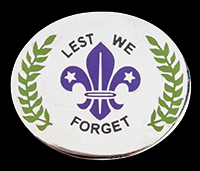 At this Reunion everyone was given a 'Lest We Forget' badge to show our support for the National Scout Memorial in Birmingham to remember past members who devoted so much to Scouting. Ex-members of the Group please register here so we can keep in touch. View photographs of some Old Scouts enjoying the company of fellow Diehards at a recent Diehards Reunion in London.